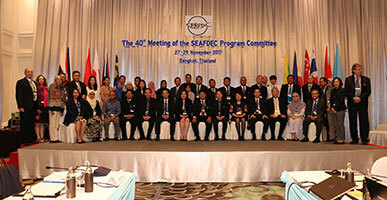 SEAFDEC organized the 40th Meeting of Program Committee (40PCM) on 27-29 November 2017 in Bangkok, Thailand and aimed to review the projects implemented in 2017 and endorse the projects and activities that will be implemented in 2018. The Meeting was hosted by the Marine Fisheries Research Department (MFRD) in cooperation with the SEAFDEC Secretariat. The 40PCM reviewed 20 projects under the FCG/ASSP mechanism, two special projects, one new project, as well as two pipeline projects which will be implemented in 2018. In addition, the Program Committee Members suggested that the Key Performance Indicators (KPIs) should be developed for all SEAFDEC projects to be used as tool for the evaluation of projects. The new Resolution on the Future of SEAFDEC Vision, Mission, and Strategies Towards 2030 suggested that SEAFDEC should start to harmonize the programs with the new six strategies. Moreover, the Meeting took note of the draft Japanese Trust Fund 7 (JTF-7) framework together with project proposals which will start in 2020 with duration of approximately five years. Back-to-back with the 40PCM, the 20th Meeting of Fisheries Consultative Group of the ASEAN-SEAFDEC Strategic Partnership (20FCG/ASSP) was held on 30 November-1 December 2017. 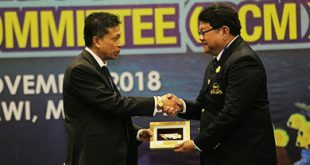 The Meeting highlighted the follow-up actions carried out by SEAFDEC and ASEAN Member States (AMSs) with respect to the directives given at the 49th Meeting of the SEAFDEC Council, meeting of ASEAN bodies related to fisheries, and other meetings of SEAFDEC. 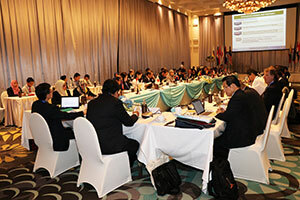 Status of programs and activities implemented by SEAFDEC in 2017 under the FCG/ASSP mechanism endorsed by the 40PCM, the progress of proposals under ASSP framework, and important issues on the fisheries sector of the AMSs, especially on stock assessment and combating IUU fishing, were also discussed. The results and recommendations of the 20FCG/ASSP would be submitted to the SEAFDEC Council and the ASEAN Sectoral Working Group on Fisheries (ASWGFi) for endorsement to the higher authorities of ASEAN.